The weather is growing warmer, the days longer, and the grass higher…and you know what that means right? Maybe yard work isn’t exactly your favorite thing to do (or maybe it is), but a reel mower might be just the thing to inspire a new-found love for mowing that lawn. We’ve talked about eco-friendly ways to cut keep a lush and quoft lawn before, but reel mowers and electric push mowers always seem to have a fair amount of cons to their pros. This new reel mower from Fiskars, however, makes many of those negatives a thing of the past. 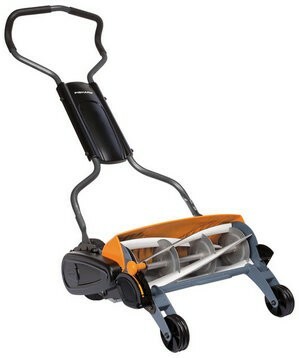 The Momentum reel mower is the product of the Finland based Fiskars company. It seems like the Fiskars company fixed all of the most common complaints with reel mowers in their cross hairs and pulled the proverbial trigger. The Momentum also features a new patent pending technology that Fiskars calls “InertiaDrive”. This technology combines the large diameter cutting reel and heavy blades to store energy (like a flywheel) until a burst of extra cutting power is needed. 2X More Cutting Power: Delivers twice the energy to power through small twigs, weeds, or dense grass that would jam other reel mowers. 30% Easier to Push: Advanced technologies reduce cutting system friction, provide optimal blade positioning and deliver extra cutting power to reduce push force by 30% in long grass. Their frequent jamming when rolling over small twigs or rouge bits of mulch. Fiskars appears to have addressed the jamming issue through the InertiaDrive technology. To deal with the irritation of a required low cutting height, Fiskars outfitted the Momentum with a one-touch height adjustment that allows for a max setting of 4” high. If your grass is any higher than that, you’ve got your laziness to blame, not your mower. It seems like the Momentum reel mower is the real deal indeed. We’ll see if we can’t get our hands on one to knock out a real life review for you. Have you ever tried a reel mower or electric push mower? Did it work out well or were the cons just overpower the pros?